Landon Kennedy made the start and took the loss for the Tigers. One of the toughest lessons in life is to reach so close to something one has worked for, only to have it fall out of grasp. A season ago the Madison County Cowboys made their first appearance in the state Final Four, where they reached the finals and narrowly fell short of winning immortal glory. Yet from that difficult experience the club returned stronger and more determined this season, fighting their way through several tight playoff battles to earn a return trip to take care of unfinished business. Friday night the team took care of the first step of their 2018 redemption tour, defeating the two-time defending state champion Trenton Tigers 4-2 in a Class 1A state semifinal at Hammond Stadium in Fort Myers. The Cowboys (16-10) advance to Saturday afternoon’s 1A championship, where they will take on the Port St. Joe Sharks. The Sharks (15-10) also reached the title game following a 7-3 victory over the Blountstown Tigers in Friday’s other semifinal action. 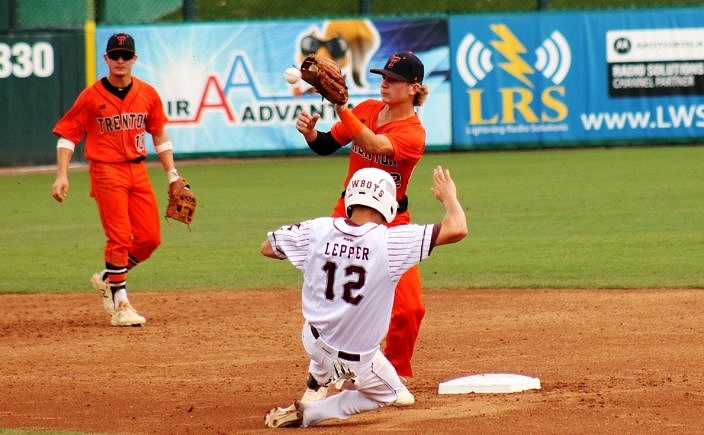 Pesky, unrelenting rain and lightning storms continued to plague the state tournament on Friday, as the Cowboys’ semifinal was twice halted by weather, before finally resuming action following nearly a seven-hour delay. Despite the layoff, Madison County maintained its lead and held the Tigers scoreless over their final six outs. The Tigers catch out a potential base-stealer to end the first inning. The Cowboys wasted no time in getting after it, taking a 3-0 lead with their first swings in the bottom of the first inning. Dylan Bass drew a lead-off walk and Dustin Bass lined a single to center for Madison County’s first hit. Starting pitcher Dilan Lawson then provided his first run support to get his club on the board with an RBI single to center. After Drew Annett was hit by a pitch to add another base runner, Logan Lepper delivered a clutch swing with a base hit to right field that plated courtesy-runner Riley Borgert and Lawson. Madison County added its other run in the second to extend the lead. 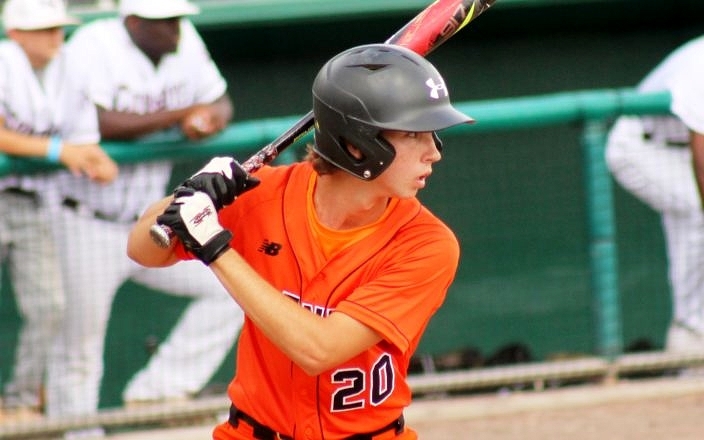 Dawson Rutherford put a solid swing on an 0-1 offering and lined it into the left-center field gap for a lead-off double, and Dylan Bass then got into the action with a base hit to right that pushed Rutherford home. The Tigers (20-7) answered back to get on the board in the third, while also finding the road ahead made slightly tougher in the process. Trenton strung a few hits together, as Daniel Plank reached on a fielder’s choice, Wyatt Langford followed with a double into the left-center gap and Trey Sanchez lined an RBI single past third base. But starting pitcher Landon Kennedy was ejected from the game after cleating the first base man on a 6-3 putout that ended the frame. Jacob Guthrie steps in for his first at bat at Hammond Stadium. Trenton went to left-hander Trent Becker to replace their ace on the bump. The southpaw held the rope, keeping the Cowboys off the scoreboard over the final four innings. Becker allowed a hit and three walks, and struck out two. The Tigers inched closer with their only other score in the fifth. Blake Hall started off the inning with a base hit to right field, before then advancing to second base when Chase Molloy dropped down a great bunt along the first base line that left the defense unable to make the play as Molloy reached with an infield single. Plank also dropped down a bunt and reached on a fielder’s choice that loaded up the bases. A fly ball off the bat of Wyatt Langford went deep enough to center to allow Hall to score on the sac-fly RBI. But that was as far as Trenton was able to take its comeback bid. 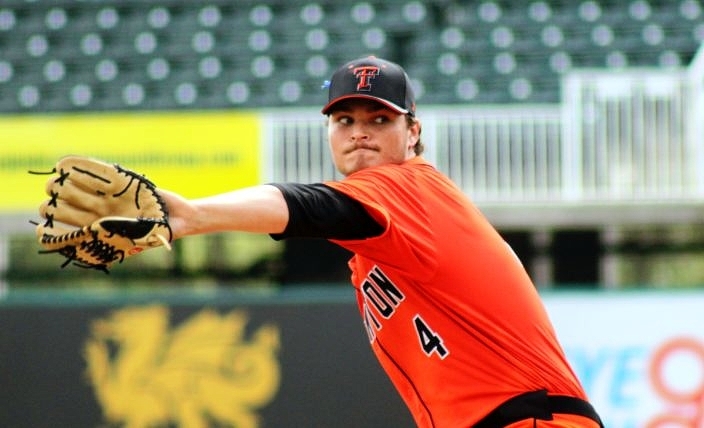 Lawson did his part through five innings to earn the victory, surrendering six hits and two walks with one strikeout. Drew Herring earned the save with two scoreless innings of work following the long delays, as he walked one and struck out three.